Over the last 20+ years I’ve had the privilege of working with a diverse range of amphibians, including a number of Endangered and Critically Endangered species, both in situ in fantastic places like north Queensland, south-west Western Australia, New Zealand, the eastern USA, the Caribbean, the Seychelles and the British Channel Islands, and ex situ. 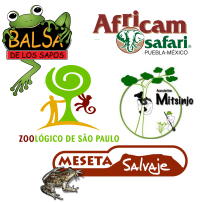 In terms of ex situ experience, I’ve worked with forty-eight amphibian species in institutions in three countries, including representatives from all three orders, and I’ve been involved with a number of ex situ conservation programs. The first night I spent doing frog field work literally changed my life – I decided that, much as I loved fish, it was really all about the frogs. I was born in the US, and my family lived in the Bahamas and then Florida before moving to north Queensland when I was thirteen – these were all fantastic places to spend lots of time outside exploring, and I spent many very happy hours finding and watching wildlife. 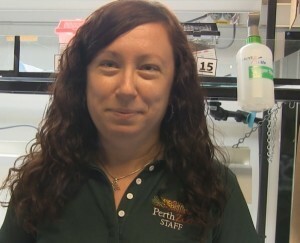 I don’t think it surprised anyone when I subsequently decided that I wanted to be a biologist! I have to admit that I actually went to uni (James Cook University in Townsville) intending to be a marine biologist, not a herpetologist. I’d always been really partial to frogs, though, so when I was in my second year and a PhD student working on rainforest frogs needed a volunteer, I signed on the dotted line. The first night I spent doing frog field work literally changed my life – I decided that, much as I loved fish, it was really all about the frogs, and switched from focussing my studies on marine biology to terrestrial and freshwater ecology. My first ‘professional’ experience looking after frogs in captivity was providing keeper cover for a colony of threatened Sharp-snouted Day Frogs at James Cook University over the 1993/94 holiday period. These frogs had been brought into captivity because population numbers were crashing in the wild, and all of the captive individuals subsequently died as well. It wasn’t until 1998, when Berger et al. documented Batrachochytrium dendrobatidis in Sharp-snouted Day Frogs that had died in the wild and in the James Cook University colony that we finally understood why the losses had occurred. Even though I was only involved in a minor capacity, this experience working with one of the species that was sounding the alarm for amphibian biologists globally was an incredible learning opportunity for me. While I continued working and studying at James Cook University, I gained additional amphibian husbandry experience by caring for a range of tropical frogs that were maintained as classroom animals. I moved to New Zealand in early 2003, and it was while I was living there that I shifted from working in the field and in labs to working in a zoo. I grew up reading Gerald Durrell’s books and always believed that good zoos were really well-positioned to make meaningful contributions to wildlife conservation, so I decided to apply when I saw a keeping position advertised at Hamilton Zoo. Given they were looking for a mammal keeper they definitely took a chance employing an amphibian ecologist! Funnily enough, though, that mammal keeping job led me right back to amphibians. While I was working there, opportunities arose for the zoo to become involved with conservation efforts for both Archey’s and Hochstetter’s Frogs, and, since I’d previously worked with both species in the field for the New Zealand Department of Conservation and also had frog husbandry experience, I was ideally placed to establish facilities, develop husbandry protocols and care for the frogs. I really enjoyed working with frogs again, so, in 2006, I attended an Amphibian Conservation Husbandry course at Durrell Wildlife Conservation Trust in the British Channel Islands. That was another pivotal event in my career, as it ultimately led me to leave New Zealand to take up the position of Amphibian Specialist/Senior Keeper in the Herpetology Department at Durrell. This was a fantastic opportunity for me, as I had the chance to work with a wide range of species from different families, habitat types, etc. I also got to work with and learn from some fantastic people based in that part of the world. In addition to husbandry and captive breeding of both amphibians and reptiles, I was also involved with managing the department’s amphibian programs (including breeding and rearing Critically Endangered Mountain Chickens for release to the wild and head-starting local Agile Frogs), reviewing and improving amphibian biosecurity and husbandry standards, over-seeing annual cycling/breeding regimes and contributing to the design and establishment of biosecure units for conservation breeding programs. I also undertook in situ conservation work (with Common Toads and Agile Frogs on Jersey and Mountain Chickens in the West Indies), trained staff from the department and from other institutions in amphibian husbandry and contributed to organizing and teaching an Amphibian Conservation Husbandry course. In 2010 I decided it was time to come back home to Australia, and I accepted a position at Perth Zoo. In my initial position of Supervisor of the Native Species Breeding Program, I was very closely involved in our head-start for release programs for both threatened White-bellied and Orange-bellied Frogs, and in breeding threatened Sunset Frogs. I’ve since taken on the role of Curator Collections, but I’m still involved in our native amphibian conservation programs. Spring is my favorite time of the year, because I get to join some of the other members of our fabulous frog team on one of the White-bellied and Orange-bellied Frog field trips! 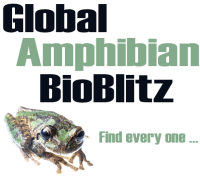 I’ve been a Co-Convenor of the Zoo and Aquarium Association (Australasia) Amphibian Taxon Advisory Group since 2011, and I’m also a member of the IUCN Amphibian Specialist Group’s Conservation Breeding Working Group. Through these roles, I help develop and promote best practice in ex situ amphibian management. I know first-hand that zoos can make significant contributions to recovery efforts for threatened species, and I’m more than happy to share any knowledge and experience I have that’s of value to others.